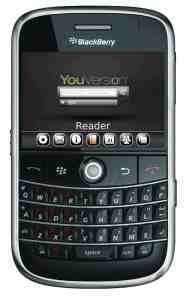 YouVersion have just released the first fully tested version of their free Blackberry bible application. This promises to be a truly useful application for those with a Blackberry, and if it is anything like their free iPhone bible application it will be regularly improved. Unlike the iPhone application this does not offer the ability to download bibles, it is all done via the Blackberry’s internet connection. You can choose from 35 translations in 19 different languages and there is a quick search engine to help you find any verses with specific words in it. There is a one year bible reading plan as well which is the kind of function that is really useful on portable devices. I enjoy reading the word of god, & if I had an app on my phone I would use it almost everyday. Will this application work on Blackberry Tour? It kept sending me back to the same place…never got to download it like a circle??? It pleasure 4 me to hi to everybody in advanced. Iam a new christian ,thanks for the material. Good Post. You can check BFABP .